! !You NEED to have the Scania griffin DLC!! First of all this mod is not stolen from a Turk guy. Made with my own Def files. You don’t have any permission to upload it anywhere else on different name. If you want to put it on your page provide my name and my sharemods download link. Added scania bullbar (you can remove that to click on the bullbar options and choose other bullbar and remove that bullbar, the scania bulbar won’t show up again then. Bug fix of Rear Bumper. INFO: I tried to add the exhaust of the scania, but that was without succes. I tried to add lot of different ways and things on the volvo and mercedes to add the rear bumper but without succes. 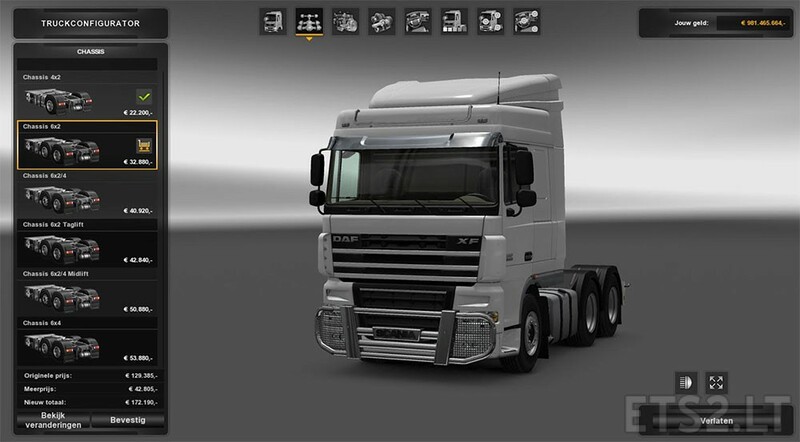 I tried to put scania sound as option in it and 750hp engine. but if you edit (Like putting roofbar or other wheels..) one thing those 2 just disapear and bugs everything out so sadly no v8 sound in daf and 750 hp engine. Step 1: Put the mod in the mod folder. Step 2: Start SINGLEPLAYER and activate the mod in the mod manager. Step 4: When you have bought your truck you have to save and start online. Step 5: When MULTIPLAYER starts up the games says this mod can’t be used and such because multiplayer, JUST CLICK NEXT NEXT and NEXT! 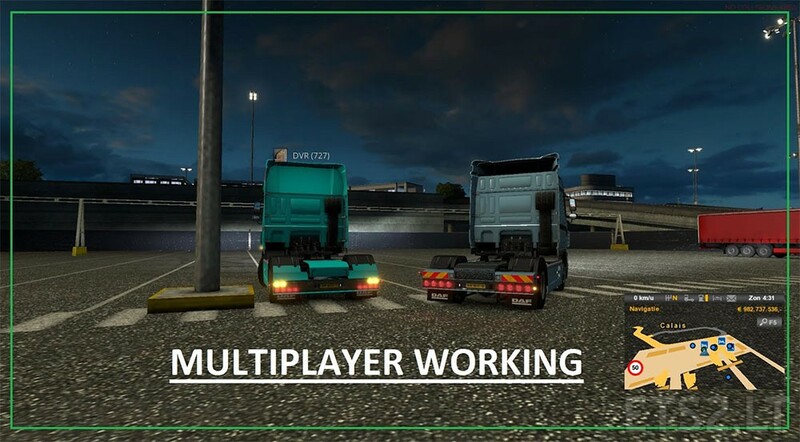 Step 6: Now you can see your bumper and all in multiplayer. have fun driving and wish you guys the best. By the way if you chose other cabins or chassis the bumper will stay on it so don’t worry, but in multiplayer watch a bit out when putting the lamps and al on the bullbar, because when its removed you have to buy the truck again in singleplayer. Why does it say Scania in front?? It’s the bullbar from the scania. Ingame in the dealer you can choose a other bullbar and then remove the bullbar, then it won’t show the bullbar in SP and MP. 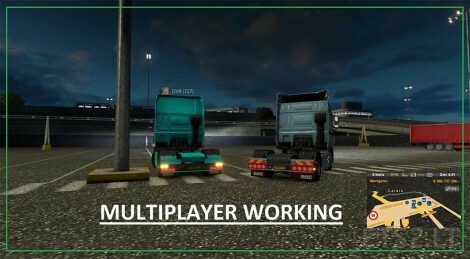 And sorry i can’t change it to DAF, then i would not be compactable with Multiplayer. and that the mod is compactable with multiplayer is important. can you make the trucks maybe 750 hp ? Possible to have the scania tail lights on other trucks? Say the Inveco? 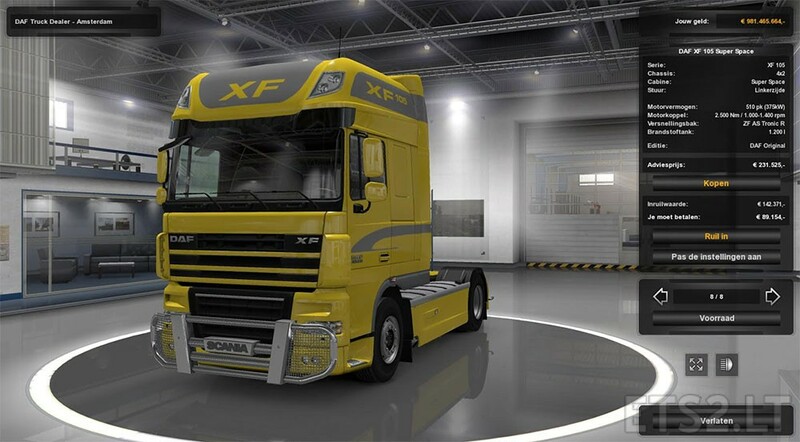 Is it possible to do that for the Renault Magnum? Can you say me how to edit the sii?